Six kilometers down the trail one can see the ruins of a Byzantine church, located about 300 meters east of the village of Anab al-Kabir (22 kilometers southwest of Hebron). 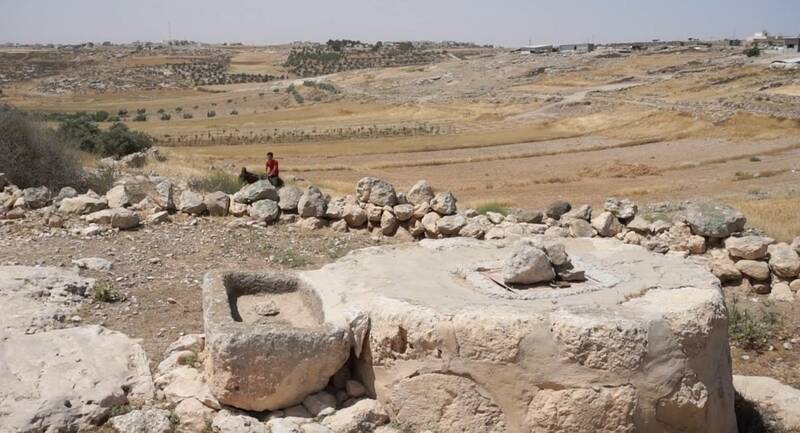 The compound served as a main religious center for the neighboring locations and includes parts of mosaic floors and the remains of a wine press and an impressive grain mill. The masar also passes through populated areas and just next to the primary school of Anab al-Kabir. If you hike on a workday, it is very possible that students on their way home from school will join you for some part of the trek. 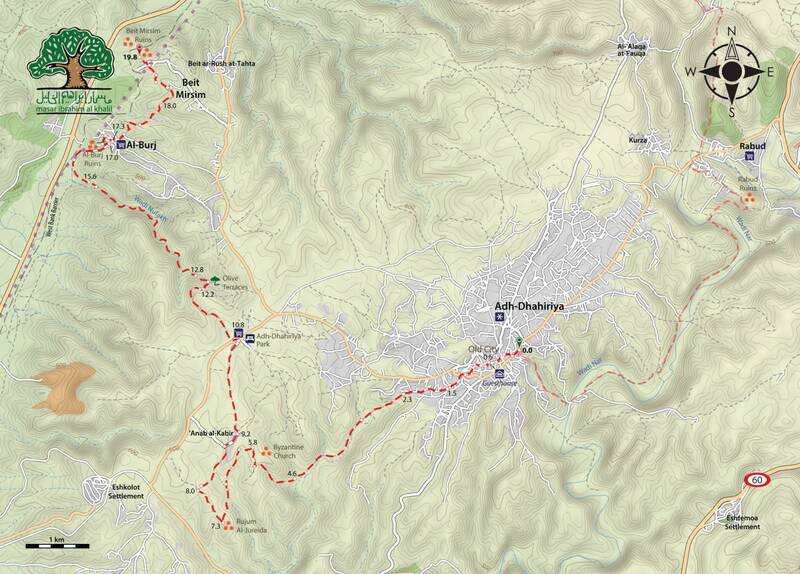 After Anab al-Kabir, the trail turns back to the north, leading to the suburb area of Adh-Dhahriya, where small shops can be found – a great place to refill supplies of cold water for the rest of the day. The trek also passes next to an amusement park and garden where hikers can take a break and rest in a shady spot. The final part of the trail leads through the picturesque Wadi Nufakh, a valley that becomes a river during the rainy season. The slopes of the valley are rich in various shrubs, including felty germander (Teucrium polium), in Arabic jedeh (الجعدة), which is widely used in popular medicine for treatment of stomach ailments. A small olive grove, ideal for taking rest in the shade, is located in the middle of the valley. Before reaching the village of Al-Burj, famous for housing the remains of a Crusader-period fortified castle and a church, the trail passes just next to the Israeli separation barrier. The Wall is also later visible from Beit Mirsim, the final location on Masar Ibrahim al-Khalil. 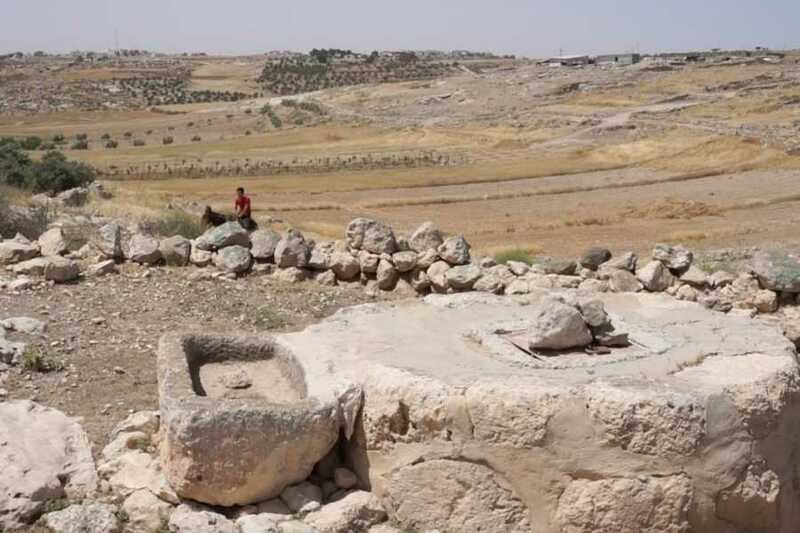 The village is rich in heritage and includes such historical sites as a Byzantine olive press and a shrine of the Prophet Handal (Maqam al-Nabi Handal). Close to the village lies Tell Beit Mirsim, an ancient archaeological site, dating approximately to the eighteenth century BC. The site is now located on the other side of the wall and is inaccessible from the West Bank.